Delving into El Campello requires a trip through centuries of history. Throughout the length and breadth of the municipality we can find traces of the main civilisations which inhabited the Iberian peninsula. The oldest remains can be found in the Illeta dels Banyets, an exceptional place for discovering our history. Having completed its museological preparation we can say that it is one of the best Archaeological Sites of the Mediterranean. The first settlements found here date back to prehistory, to the Chalcolithic and the Bronze ages, in the second millennium before Christ. Of particular importance are the remains of the Iberian settlement, unique due to their features, and considered one of the most important of the Mediterranean. The fact that very few homes and many warehouses and ceramics have been discovered leads to the conclusion that there was considerable production activity relating commercially to other cultures of the Mediterranean. In the settlement, two buildings, similar to temples, have been discovered which are unusual for these kind of settlements. From the Roman era, small thermal baths stand out, and in particular the fish farms - hatcheries cut into the stone, which have given their name to the enclave through popular tradition, known as Els Banyets de la Reina (The Queen’s Baths). The bathing pools which, according to tradition, were for the exclusive use of a beautiful Moorish queen, are, in reality very important constructions of the era, used to preserve fish and which led to an important salted fish industry and to the valued “garum” sauce. The nearby Aigües ravine also holds historic importance as it was the border between the kingdoms of Castile and Aragon. King James II finally annexed these territories to the Aragon crown and also to the kingdom of Valencia in 1296. 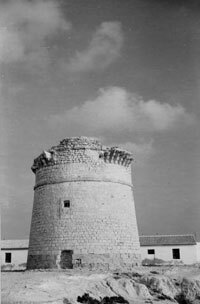 The continuous invasions of our coasts by Berber pirates led to the construction of a security system in the 16th Century which consisted of circular watchtowers along the length of the coast in order to help defend a scared and disperse population and to prevent them from becoming the victims of pillage and plundering. Two of them still stand in El Campello: that one of "El Barranc d'Aigües", on a clifftop and the one of "La Illeta". The latter, finished in 1557 and restored at the end of the 20th Century, is symbolic for El Campello people and is used as a celebration point for different events and is the emblem of our town. But we don’t find the real origins of the municipality until the 18th Century, when the owner of the land, Mr. Nicolás Pérez de Sarrió, brought the first colony families here to cultivate land. The “Mercedarios Convent”, the first parish of the municipal district, belongs to this period. At the end of this century the first shipyard was built in the mouth of the dry river “Seco” (Montnegre), the seeds of an emerging fishing industry which, in some way survives today, and which had one of the most significant fleets of the Mediterranean. This fact led to the development of the fishermen’s neighbourhood, which has today been transformed into the focal point of tourist attraction. The rustic Villa Marco estate dates from the middle of the 19th Century and was very important in the agricultural area known as "The Huerta de Alicante" (fertil region of Alicante). At the beginning of the 20th Century, under the auspices of Renato Barin, honorary Consul of France and owner of the estate at that time, several renovations took place which gave the estate a residential feel and a modern style with interesting French colonial art influences. Also dating from this period are the Versailles inspired gardens which hold flora originating from different parts of the planet, centuries-old trees and a collection of sculptures by the renowned Alicante artist Vicente Bañuls. On a trip through El Campello, an unavoidable stop-off is the Parish Church, built in 1849 which replaced the first church to be built in El Campello at the end of the 18th Century, and which is devoted to the worship of Saint Theresa. It underwent several extensions in 1909 and 1911. Between the 19th and 20th Centuries, El Campello’s personality became so exclusive that it separated from Alicante in 1901, with its limits being definitively set in 1903.